There is a lack of representative prevalence rates for attention deficit-/hyperactivity disorder (ADHD) according to DSM-IV criteria and hyperkinetic disorder (HD) according to ICD-10 criteria for German subjects. To report the results of analyses of categorical data on the prevalence rates of the symptoms of ADHD/HD and additional diagnostic criteria, as well as of the diagnoses of ADHD and HD according to symptoms and other diagnostic criteria, according to the ICD-10 and DSM-IV. Further, to report administrative prevalence rates of the diagnosis and rates of co-existing behavioural and emotional problems. Within the BELLA module of the German Health Interview and Examination Survey for Children and Adolescents (KiGGS), a representative sample of parents of 2,452 children and adolescents aged 7–17 years completed an ADHD symptom checklist (FBB-HKS/ADHS) and additional questionnaires for the assessment of coexisting behavioural and emotional problems. The prevalence rates for the diagnoses of ADHD according to DSM-IV criteria were 5.0% and the rate for HD according to ICD-10 criteria was 1.0%. Higher prevalence rates were found in boys and in younger children. The addition of other diagnostic criteria (impairment, pervasiveness, onset, duration) resulted in a significant decrease of the prevalence rates of ADHD and HD to 2.2 and 0.6%, respectively. Higher prevalence rates were found in families of lower socioeconomic status and families from urban areas. The lifetime administrative prevalence rate was 6.5%. 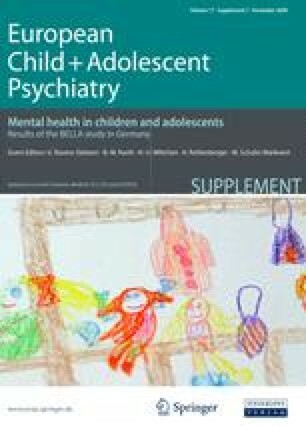 Children with ADHD had an increased risk for coexisting behavioural and emotional problems, especially for aggressive and antisocial behaviour problems, but also for anxiety and mood problems. The results of the national sample are in line with community studies in other countries. The effects of the additional diagnostic criteria of impairment, situational pervasiveness, symptom onset and symptom duration on the prevalence rates have to be considered in other epidemiological studies. Members of the BELLA study group: Ulrike Ravens-Sieberer (Principal Investigator), Claus Barkmann, Susanne Bettge, Monika Bullinger, Manfred Döpfner, Michael Erhart, Beate Herpertz-Dahlmann, Heike Hölling, Franz Resch, Aribert Rothenberger, Michael Schulte-Markwort, Nora Wille, Hans-Ulrich Wittchen.